Home » Videos » This Kid Is Between Two Gigantic Dogs, Watch How The One One The Left Reacts… WHOA! 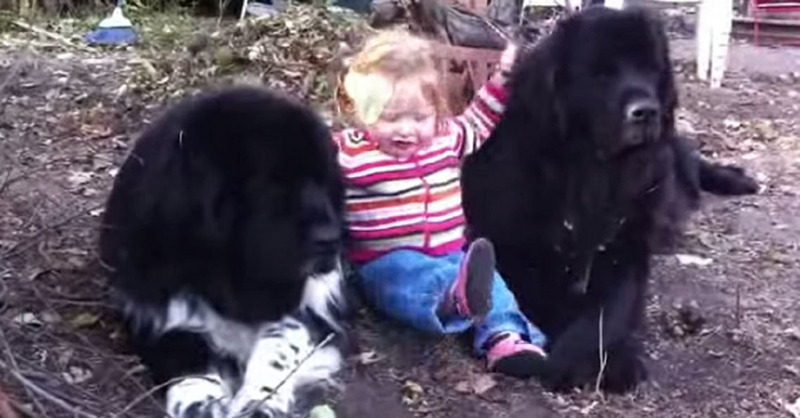 This Kid Is Between Two Gigantic Dogs, Watch How The One One The Left Reacts… WHOA! Isabelle happens to be one of those kids who are born as natural dog lovers. Two huge dogs, one called Bella and the other Bear are her best friends. The two gigantic Newfoundland dogs weigh 270 lbs in total. Though other parents could have not let their kids to be around such huge dogs, Isabelle’s are not worried seeing their daughter around them. Bella and Bear seem to have all the patience in this world since it appears they even enjoy it when the little girl is around them. Though this may surprise many, in most cases, big dogs are much more docile when compared to smaller ones. If you doubt that, you have to watch what takes place when one tiny Chihuahua chases a gigantic pit bull. Parents must note that they have to be very careful when they need to introduce their kids to pets – particularly dogs. Kids may go beyond the limit with their fur pulling tricks. Take for instance Isabelle, who thinks the dogs’ legs can be a chair. Luckily, Bella and Bear can tolerate that since they are understanding babysitters. They are really true loyal companions! Do you encourage getting kids pets? Comment below and SHARE this clip on Facebook with friends!